Lark Books has plans to publish a how-to book on anodizing aluminum and is accepting images of anodized aluminum jewelry for the gallery section of the book. Needless to say I will be entering this one. Entries are due May 25, 2009. Submission info can be found here. It's been a week since I got the new dyes, but I haven't done more than one test piece of each of them. I want to test a couple of them again, but I think most of them are pretty good. I'll post photos sometime. My carved ebony piece is coming out ok. I took this photo last week, the front still looks about the same, most of the work I have been doing lately has been on the back. The edges are kind of chipped , but that's not hard to fix. The problem I have been having is smoothing the wood. I'm trying some different things, but I'm not really sure what the best way is. I got the new anodizing dyes today from Caswell Plating. I got green SCG, copper, yellow 4A, grey NLN, golden orange, and violet 3D. I am really hoping the green is good. 4 ounces of concentrate makes 2 gallons. I usually just mix 1/2 gallon unless I am anodizing something that needs more. They are mixed with distilled water. I didn't have enough water to mix one of the dyes. 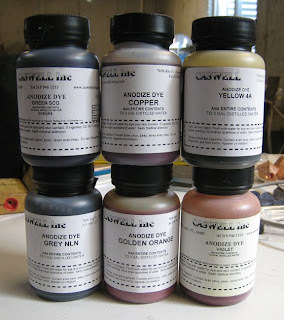 I will get some more water and start testing these dyes later today. This is another brooch I started last year that was in the drawer with the other unfinished pieces I had forgotten about. I worked on it some more, and I think its ready to anodize. I am getting a little sick of the colors I have so I ordered some more the other day. I am going to wait till I get those and test them before I decide what color to anodize this piece. Since I got some wood for the stands for my brooches and hammer handles I have wanted to work with it more. So when someone asked me if I could make them lock picks with wood handles I was happy to give it a try. This is the second one I made for that person. The handle is zircote. I know I shouldn't be starting new pieces with all the unfinished ones I have laying around, but I have been really wanting to try carving wood. 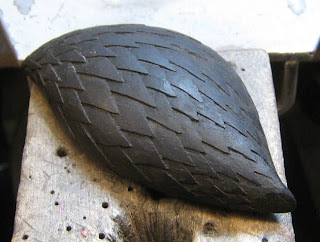 So a couple days ago I started carving a brooch in ebony. The design is similar to my aluminum work with a scale pattern on it. So far it is going ok. I haven't taken any photos. I have never really carved wood before so I was kind of worried how it would go and I thought it might be a total failure that I would rather just forget about. I think it will be ok, so I will take some pictures next time I work on it. This carved brooch was one of the pieces I found in my drawer that was very close to being finished. I started it in 2007. It's the kind of piece I could work on forever trying to make it perfect and never get it exactly the way I want it. I decided to just finish it up and move on. I thought it would be cool to polish several random scales. I was worried they wouldn't look much different from the matte finish scales after the piece was anodized, but decided to try it anyway. I wouldn't have cared if they were indistinguishable from the matte scales, but what I didn't want was for them to look only slightly different. I anodized the piece and got exactly the result I didn't want. The polished scales look only slightly different, but different enough that they don't fit in. I thought it made the piece look like I did a poor job finishing it. But that wasn't the only problem, I had lots of little spots in my anodizing. I also wanted the color to fade from dark at the bottom to light at the top, which didn't work out very well, and I didn't like the color I used (fast blue). So I decided to reanodize it. It was a lot of extra work cause I had pits open up when I etched the color off. I don't know why. I had to burnish them closed. I also put a different finish on the piece. I used scotch brite in one direction. For the previous matte finish I had used pumice. The color is blue 4A, and I got the color fade looking better. I had no significant spots in the anodizing, I think because I neutralized the acid a little differently this time. I am working on some posts showing how to set up an anodizing tank and how to anodize, so I will write about that later. The finished piece is ok. It's not as good as I wanted, I don't think it ever could be, but it's good enough and I just want the thing to be finished so I can move on to something else. When I cleaned my studio in October I decided to put all my unfinished pieces that were sitting on or near my bench in a drawer. Quite a few pieces, ranging from being almost finished to ones I had just started on. The result of my new organization was that I forgot all about them and didn't work on any of them till the other day. I remembered one of the pieces that was almost finished and looked all over for it before I remembered everything was in the drawer. Having all my unfinished work in one place points out to me just how much unfinished work I have. I don't know why I have so much. With almost every piece I can remember the reason I stopped working on it. Some I stopped working on because I had something more important come up, some I had to make a design decision on and didn't know what to do, some I just got sick of or frustrated with. I am going to try to finish up some of these pieces even if I don't really like them anymore, just so they are done. 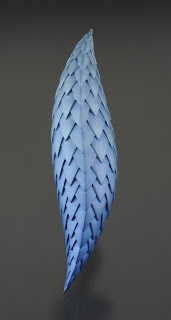 I entered the Jewelry Arts Awards last week. I entered the new brooch in my previous post, and a brooch from last year. I did well with rings in the past, but this year I didn't have any rings that I felt were worth entering. I am working on a few new pieces using aluminum and other materials. One with thin stainless steel cable, and another with ebony. I will see how these pieces turn out and then decide of I want to do more with those materials. 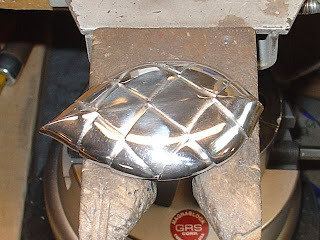 I am also working on some prototypes of jewelry made from folded sheet metal similar to the folded vessels I have done. I have been thinking about doing this for a few months, but I have only now just started working on designs. I have done several paper models for earrings, and one model out of 4" x 4" 22 gauge (0.64mm) copper. 4" x 4" sounds kind of big, but when it's folded up it's only about 1.25" wide and a little under 1.5" high. 22 gauge was the thinnest sheet I had, but it was too thick when I folded it up and the edges were binding. It also seemed kind of heavy. So I need to get some thinner metal, probably 26 gauge for earrings.